Looking for spooktacular Halloween drinks for your big Monster party? Guests of all ages will love our Zombie Bash non-alcoholic drinks! Aren’t they fun? They’re not only delicious, they add such a great flair to your party table! I love any recipe that can double as spooky decor. Makes my job as a host that much easier! Read on for how you can make this fun drink, plus other tasty treats that will go great with it. 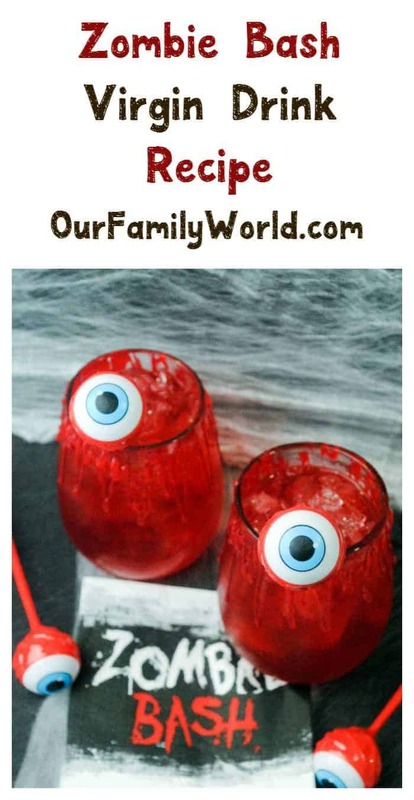 Don’t miss the printable recipe card and the video with more fabulous Halloween drinks for kids! Are you throwing a huge party this year? Do you have any favorite Halloween drinks recipes that you love to make? Share in the comments! Add the ice and stir. Take the red gel and pipe some onto the outer part of the rim, making it look like blood. Add in ice into the glasses and ladle some punch into the glass. 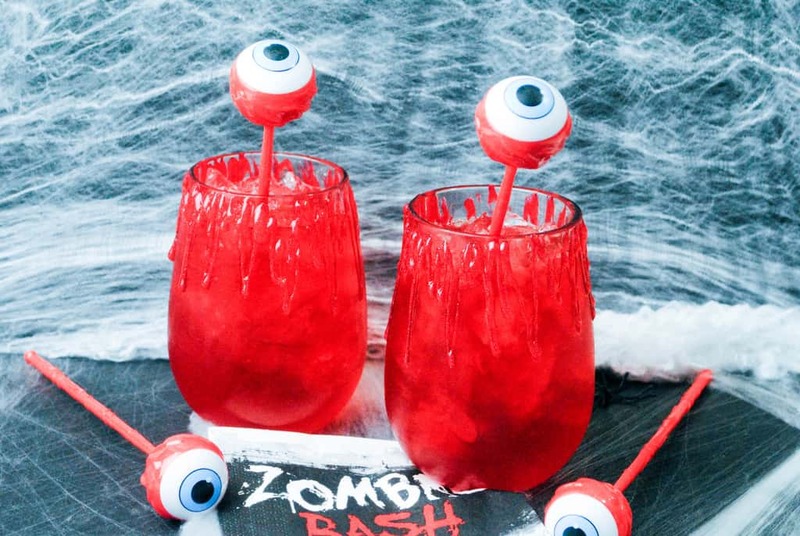 First, check out more great Halloween drinks for all ages! If you want to take the “monster party” theme even further, you absolutely have to make these Purple Eyed Monster Halloween Cupcakes! They’re a huge hit with kids and adults. Our DIY Bleeding Candles Halloween Décor Craft makes a perfect addition to your decor. It’s easy to make, so you can whip up as many as you need to really set the mood! Finally, ever monster bash starts with the invites, right? Check out these fun FREE Halloween Party Invitation Printables to send to your guests! Love the spooky non-alcoholic drinks, they’re perfect for my grandson’s Halloween party, thx for the terrific post! Awesome ideas, love the cupcakes super cute and the monster drink is awesome! Very festive and cute! Pinning and visiting from What’s Cookin’ Wednesdays! Everything looks so spooky! Especially the drinks and the cupcakes. they’re perfect. What a fun Halloween idea!! I love this, so different and great for entertaining! Thanks for sharing! I haven’t done a halloween party in a long time but these are some really cool ideas to have at one. Makes me think about what we might do for our office party. Wow, this is so nice. Perfect for the Halloween. You are such a creative person! I am so glad that this is non-alcoholic. I will add this in our Halloween party menu. Till the year 2010 most of the Indians like me were unaware of Halloween, but due to the globalization as well as the advancement of the internet; today, we are not only aware of this celebration, but we likewise celebrate it to the fullest. By the way, I love this recipe. What a creepy drink! I’m sure all the kids and adults would love it! 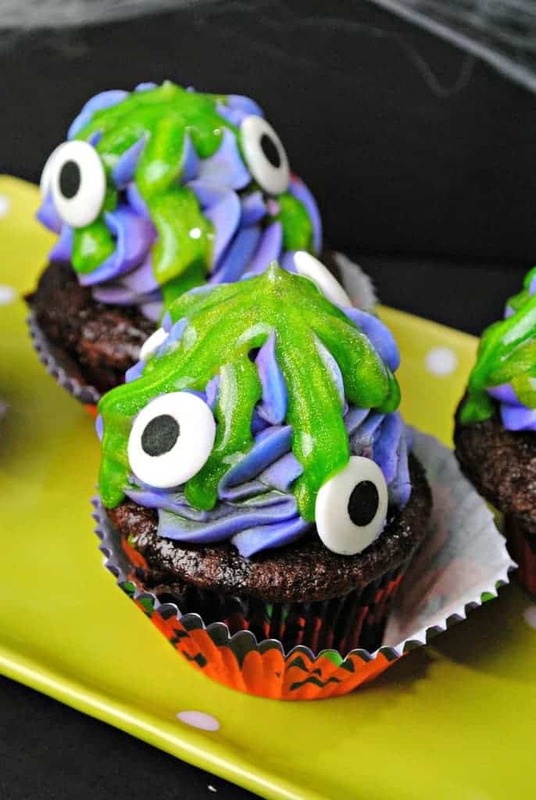 Purple Eyed Monster Halloween Cupcakes look super delicious! This is a really cute drink idea. Especially for a Halloween party! All of these look great. I love Halloween recipes. They’re always so much fun to make too. I love this idea for Halloween night! So creative. Those drinks look way creepy which makes it perfect for the kids during the Halloween! I think they’ll have a lot of fun making it with you as well. My sons were so into Halloween but never the food. They wanted to make things look spooky, gory and bloody. I haven’t done a Halloween party in such a long time. Seeing these drinks and other treats makes me want to host a party of my own. I love how Halloween lends itself to tasty, scary goodies.